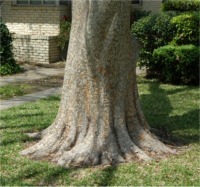 ﻿Often while doing a garden renovation will come across trees that have been improperly planted. The usual instruction from nurseries is to plant the tree at the same soil level as it arrives to you in the container. But beware -- this is not what you should always do. The landscaper who planted this tree (see photo on the right) had in good faith followed nursery instructions -- and effectively buried 6" of trunk below the ground. The black line around the trunk shows where the soil level had been. Planting a tree at the wrong depth causes the roots to girdle (run in a circular direction around the trunk -- instead of laterally out from the trunk); this girdling strangles the tree. It also causes the trunk that is buried to rot; this part of the tree trunk (the part above "the flare" -- more about this later) is not made to be buried/wet -- so it rots -- and is more prone to disease, fungus and insect problems. 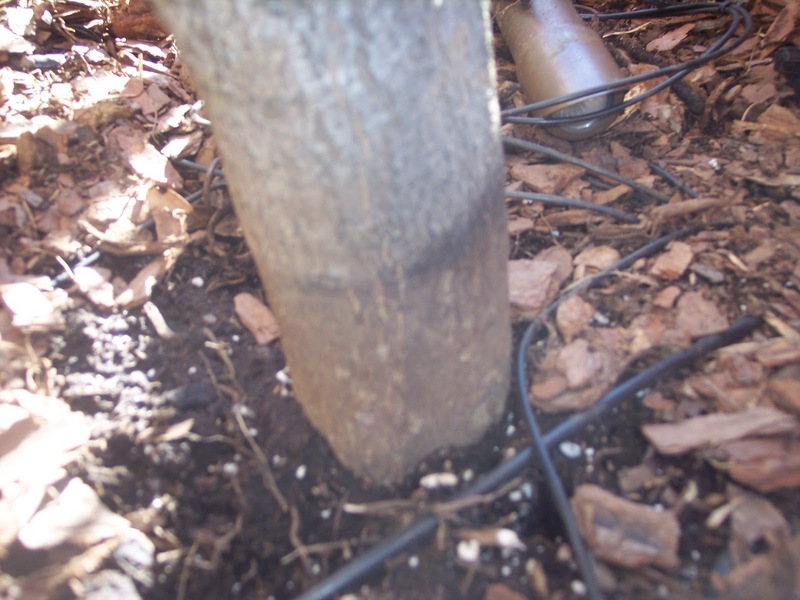 Whether planting a B&B (ball and burlap) tree or a tree in a black liner container -- you should always remove the soil around the trunk to the "flare." It is the part of the tree that abruptly or gradually flares out -- like a woman's hip -- from the trunk. The trunk and "the flare"
If the flare is buried you can do a "Root Collar Excavation."